Ginger cats are different. Not that I’m biased or anything, but they really are. I acquired my ginger cat quite by chance. Normally I wouldn’t have chosen a ginger one, because my preference is for black-and-white cats. Silly me – that was back when I thought that the human chose the cat, not the other way round! I’ve always loved those piebald, randomly decorated kitties that look as if they might once have been white cats who upended a pot of black paint in a moment of mischief, and the resultant dodging of the paint left them with an assortment of asymmetrical black splashes. So cute, especially when they have splodges of black across face and ears. It was all because I stopped at the Vet one morning to buy food for my current black-and-white cat that I saw the four kittens in the cage. I should have been in and out of Reception in a few minutes but they were busy that day, and instead of getting impatient I knelt down to look at the kittens. One was white with dark grey splodges, and the other three were ginger. Naturally I was attracted to the grey-and-white, but that kitten wasn’t interested in my overtures through the bars of the cage. Instead, one of the ginger kittens leapt to its feet and began prancing up and down, meowing and trying to grab at my fingers, singing and dancing like a desperate drama student at its first audition. What moved me most was the fact that it didn’t do that to anyone else in the crowded waiting room; only to me. I had been chosen. The receptionist offered to open the cage so that I could take the kitten out for a closer look. You know where this is going, right? Next thing I knew, I was letting my new kitten out of the borrowed carry-cage onto my lounge floor, and wondering what to call her. Her? Yes, she was a female ginger cat. Most ginger cats are male, just as most tortoiseshell cats are female. Don’t ask me why – I’m not a cat geneticist. 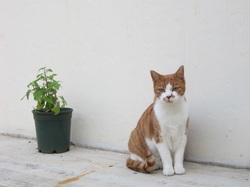 The vet explained that in females, the ginger is always mixed with white, which is inherited from the female gene… But, like I said – I’m not a cat geneticist; just a cat lover. That was it. I had a name for my kitten: Galadriel! Galadriel can be demanding, offish and easy-going all in the space of one hour. She stands on her hind legs and taps my thigh with a front paw if she thinks I’m ignoring her, but when she’s in one of her moods, she growls and yowls if I pick her up, just like a tetchy teenager hissing: “Don’t touch me!” At other times she nuzzles and caresses with such enthusiasm that she frequently has small gouges or bare patches from head-butting something that was rougher or sharper than she thought it was. As Galadriel grew – sideways, mainly – her resemblance to a tall, elegant elfin queen faded. She has remained vocal about her likes and dislikes, but unfortunately she grew up to be the clumsiest cat in the universe. If Galadriel is asleep, I don’t dare to wake her. Traditionally one does not pull the tiger’s tail, although in Galadriel’s case this is not for fear of awakening some kind of dragon, but rather because the tiger will play clumsily with anything it can get its little paws on, and my writing will be out the window for another half an hour. She’s no Olga Korbut either. On one memorable occasion, she galloped across the floor, took a flying leap onto the table beside me, skidded on a sheet of paper I had left there, and ploughed into me, paws flailing for some kind of grip. Her outstretched claws found their grip when they landed on my face, and one scratch narrowly missed my right eye. I had a bruise and swelling on the side of my nose that looked very suspicious for a few days. But for all her frenetic activity, my clumsy darling Galadriel is a cat in a million. I’m glad she chose me, but yes – ginger cats are definitely different! This entry was posted in Susan Roberts.